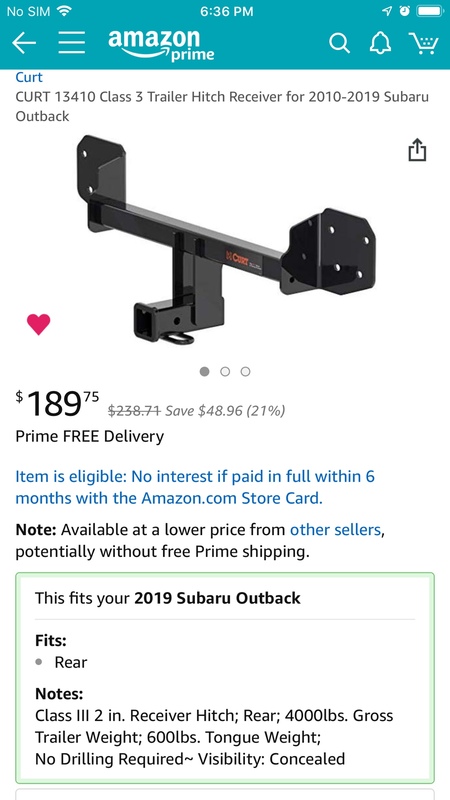 Subaru Outback - Subaru Outback Forums > Models > Gen 5: 2015-2019 > Any install the Curt 13410 trailer hitch? Location: Wherever I may roam. But usually VA.
Any install the Curt 13410 trailer hitch? Search hasnt turned up anything on this hitch. I like that it is one that mounts behind the bumper and no drilling is required. I promised i wouldn't make any holes in my new subaru. I feel like people would probably recommend the ecohitch but this is basically the same thing and made by curt, a company I trust. That is the one that I used. it was a perfect fit - no new holes required. You will have to cut the bottom of your bumper cover for the receiver though. bsu4phd, broncobilly_69 and Unnamedsource.17 like this. Does it come with trim to finish the cut on the bumper? Given it does look similar to the Ecohitch I'm curious how that's rated at 600/4,000 Tongue/towing rating to the Ecohitch's 350/3,500. Not that the Outback is capable of those tongue weights anyway. Nope the rubber trimming is not included to the package, no big deal it's not visible anyway, I did modified the cutting of the bumper to make it fit. I suspect it's the same as the Draw-Tite, just private labeled for Curt. That's what I bought. Cut trim vs drill hole... . I went with holes. I looked closely at that option as well because removing and cutting the bumper cover was a bit daunting and I have experience installing that type hitch. The reason I went with the Subaru style hitch is because I did not want to mess with the factory crumple zones. IMHO the other style is far easier to install but I feel the Subaru style is a bit safer in a rear end collision. I heard/read somewhere that this style (OEM) is stronger than the underside mount style (for lack of better nomenclature, too early). True or not, idk, if I can find the reference I’ll add it here. That was part of my decision to go this route. I'm considering the Curt as well. I too would love to hear from folks that have installed it.